A must for every driver! 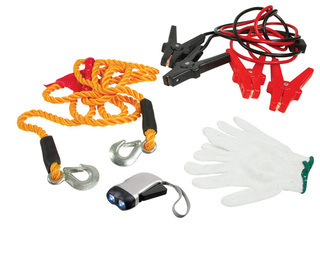 Complete with 1.8 tonne capacity tow rope, 200amp jumper leads with anti-shock resistors, torch, batteries and gloves in a handy carry bag with a night time reflective strip. Great for Conferences, Gift with purchase, Product Launches, Safety Awards, Seminars, VIP Events, Automotive, Construction, Manufacturing / Trade, Mining, Professional Services, Technology, Transport & Distribution and Travel.